Top image: Scene from Automata. Before we get started, it's important to point out that I took a normative approach to this analysis. For the sake of simplicity, I assumed a sort of status quo among humans, one in which our future selves and descendants have opted out of enhancement technologies. Clearly, should we take the transhuman path to the future, our technologically enhanced minds and bodies would better match those of robots. We may even find ourselves integrating and fusing with them. That said, we still don't know how safe, effective, and accessible human enhancement technologies will be. It's also an open question as to whether or not human enhancement will ever be socially sanctioned. The development of robotic technologies, on the other hand, shows no signs of waning. Should we humans stay the same, here are 12 ways robots could come to dominate us in the future (listed in no particular order). It's easier to build robots than it is to make humans. Currently, robots have to be designed and constructed by us, but that's set to change with the introduction of fully automated systems capable of manufacturing other robots on an assembly line. While still in its primitive stages, researchers at the Modular Robotics Lab at the University of Pennsylvania have already developed a robot that can build other robots with spray foam. Robots of the future will also be capable of reproduction, or what mathematician John von Neumann referred to as kinematic self-replicating machines. Researchers are the University of Oslo have already developed squirming three-limbed starfish-bots who can produce their own parts and adapt to novel environments, and Matt Denton at Robosavvy has developed a hexapod robot equipped with a cutting tool enabling it to fashion various machine parts — including, conceivably, its own parts. Considering these early developments, and given how long it takes to produce and raise a human (not to mention the costs), it's reasonable to assume we could eventually reach a tipping point when robots will start to outnumber us. As this chart from the International Federation of Robotics shows, we're already on the way there — at least for industrial robots. The IFR estimates that, from 2015 to 2017, robot installations will increase by 12% on average per year. Robots will be able to change their bodies at will. It's an advantage we humans simply won't have (mind uploading technologies aside). In the far future, robots will be able to transfer, or upload, their digital minds from one robot to another. Should a robot body fail, become obsolete, or inadequate for a given task, there will always be another one available. And as demonstrated by the fictional Cylons of Battlestar Galactica, a robot could temporarily upload its mind to the cloud in the event of a disaster or massive systems failure. The prospects of digital mind back-ups and uploading/downloading suggests that robots will be capable of surviving indefinitely. Digital or hybrid minds will be far more robust and specialized than those of humans. Our intrinsic cognitive skill-sets were forged — and constrained — by the demands of evolution, but a robotic brain could be designed to excel at any number of arbitrary tasks. Robots will be able to calculate better and faster than humans, have superior pattern recognition skills, unlimited attention spans, and infallible memory. Robots will also have improved access to their internal physical and cognitive states. It'll be easy for us to upgrade robots, but they'll eventually be able to do it themselves. From the time we first became an agricultural civilization, it took us humans 10,000 years before we were able to start understanding our biophysical, psychological, and cognitive makeup. We've modeled the physical recipe of the DNA that underlies our cells and entire body. And now, we're just at the beginning of understanding our cognitive processes, the makeup and programming of our mind. But robots are going to have a huge head start on us. Open source approaches are going to be applied to their physical makeup and programming, allowing us to accelerate their design. But those same tools will also be available to them. Instead of the 10,000-year struggle faced by humanity, robots will be able to gain almost instantaneous knowledge of their physical and cognitive make-up. Consequently, robots will improve faster than humans and adapt quicker to new environments and hurdles. Unlike us humans, robots won't be bogged down by the legacy of reptilian and mammalian cognitive "operating systems" and the various problems associated with them. Unless they're explicitly programmed to do so, robots won't get restless or bored, or experience sudden shifts in mental clarity and mood. They won't get emotionally swayed or biased, or be prone to addictions. And perhaps most profoundly, they won't experience mental anguish or physical pain. Robots will likely exert a smaller ecological footprint than humans and require fewer resources to function. This will allow them to become far more productive and cost-effective than humans. Humans convert food and oxygen into energy, an inefficient process compared to what will someday power robots. If the wages of one person will be able to buy enough electricity to "feed" scores of intelligent robot workers, who will ever hire us? And since robots won't need to eat or breathe, they won't have to worry about preserving the environment and so will be able to cheaply dump their industrial waste. Robots could also be programmed to be morally infallible, or at least as moral as possible, given the complexities of moral decision-making (the vexing trolley problem is a prime example). Unlike humans, robots imbued with a pro-social moral code could exercise extreme consistency and predictability. People who have studied human morality in the context of machine ethics, including the likes of Ron Arkin, point out that we humans are are pretty much worthless as far as ethics are concerned. We will always lie, cheat, steal, and shoot first. Why does that make robots better? Because robots could trust each other and we can't. Because robots would cooperate and humans would bicker, fight and backstab. Because robots would be morally better than us. Not only would they beat us in any full-on altercation, they would deserve to win. Interestingly, robots could prove their trustworthiness to humans by showing us their mind states. As Miller explained to me, they could make credible promises by simply revealing their source code to us. All this said, Patrick Lin reminded me about the possibility that robots can be programmed with no ethics to hold them back. Unlike humans, robots won't be affected by aging, or at least not in the same way we are. They'll never have to worry about eating (which could actually be seen as a negative), and they'll be able to put themselves into a hibernation mode for long periods of time if necessary. They won't get sick, hungry, thirsty, hungover, or have to make frequent pit-stops at the bathroom. And because they'll be immune from diseases, viruses, and toxicity, robots will be ideal for rescue missions in contaminated areas. Robots will also be able to engage in seamless mind-to-mind communication, whether it be over some kind of wireless protocol, the Web, or their own proprietary Internet. Robots will be able to connect, work, and collaborate together over a superintelligent infosphere, or machine ecology, that far surpasses human capacities. Relatedly, robots will also be able to self-organize and collaborate in swarm-like configurations. 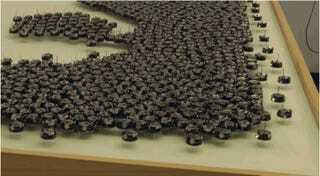 Earlier this year, for example, researchers at Harvard University created the first 1,000-robot swarm. By directing commands to individual bots with an infrared light, the researchers were able to get the tiny robots to autonomously arrange themselves into various shapes, like a five-pointed star or the letter K. In the future, the ability to collaborate and create something larger than the sum of its parts will truly distinguish robots from humans. Humans basically come in one standard physical configuration. The same can't be said for robots. They can be built at any size — from the microscopic nanoscale through to the myriad number of shapes and sizes limited only by the laws of physics. They'll also be made of advanced materials that will allow them to change their shapes in dramatic ways. Today, robots already take on many physical forms, including some that resemble spiders, birds, dogs, cheetahs, snakes, and even balls. Humans are heavy, fragile, dirty, vulnerable, picky about their environment, and have a low tolerance for the space environment (i.e., high energy radiation, extreme heat and cold, etc.). The fragility of humans, our aversion for risking human life, and the all-too-human need for consumables (food, water and oxygen) require vast amounts of money to pay for the extra engineering and multiple redundant systems we demand to reduce risk to astronauts, as well as for the vastly larger support crews needed to baby-sit every aspect of daily life during a manned space mission. [...] Fundamentally there is no real choice between robotic and human exploration of space, however. Both are synergistic and mutually dependent. Robotic exploration is necessary to enable human exploration by setting the context, providing critical information, and reducing the risk to humans. Imagine how the Apollo program would have functioned without its robotic precursors — Lunar Orbiter to map the moon's surface, Ranger to get close-up views of areas that helped perfect NASA's navigation skills (remember that NASA missed the moon with two of the first three Rangers to get that far), and Surveyor to explore the surface, determine its composition and practice soft landings. Without these robotic precursors it would've been impossible to know where to go on the moon, to design the landing hardware, or to have any real idea of what to do once we got there — other than plant the flag. As it stands, robots are set to inherit the cosmos. That is unless we design our spacecraft to accommodate the human body, including the advent of such things as radiation shields, artificial gravity, and functional/sustainable biospheres. Or we bite the bullet and re-engineer human astronauts with genetic-, cybernetic-, and nano-technologies. According to most ethical and moral standards, the life of a human person is of infinite value. The same should be said about a conscious machine, or a robot imbued with all the functional characteristics of a person. But a robot without a modicum of self-awareness — whether it be a bomb-defusing robot or a highly advanced android — simply does not warrant such a designation, and as such can be considered dispensable. Aside from its status as someone's property, a robot without a mind has as much moral standing as a rock. Consequently, mindless robots could (and are already) being used to sacrifice themselves — which will be good for such things as dangerous rescue missions, but rather frightening when we consider the potential for robots on the battlefield.